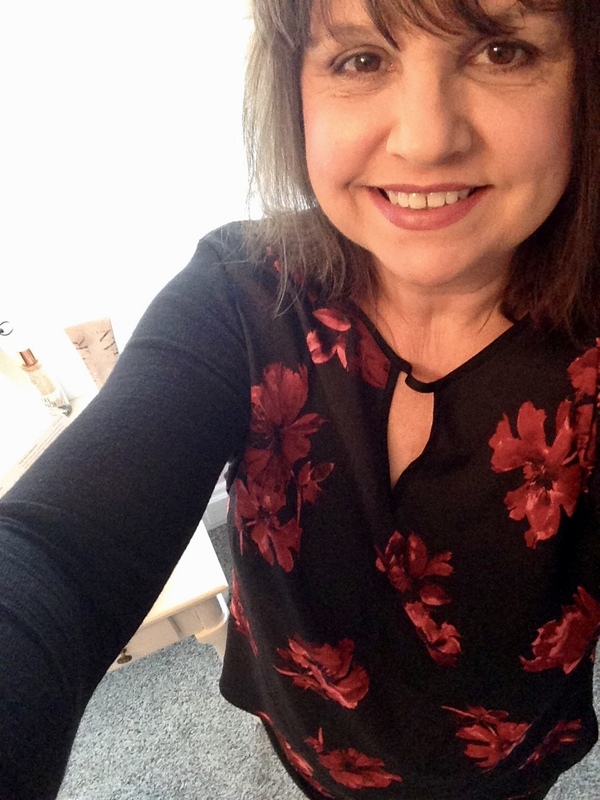 Today I have my 24th box from Stitch Fix to show you. Unfortunately the box arrived three days later than it was suppose to arrive thus I did not have my husband around to take photographs of me, so you will have to put up with blurry selfies again :( . 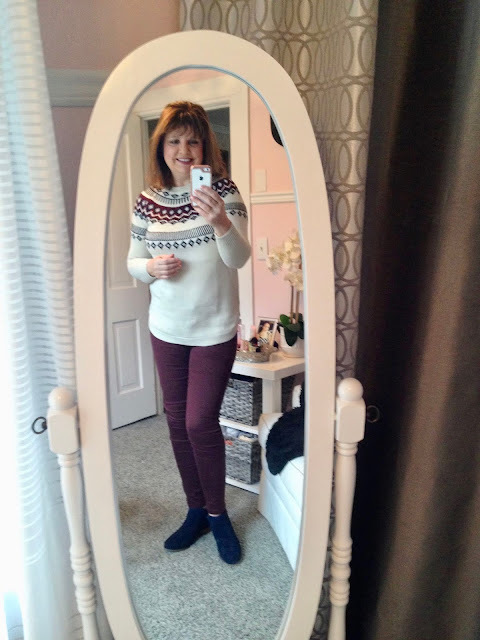 This style of sweater is super popular right now, and I'm sure that is why it was included in my box. However, I have never been a fan of this sweater style so I was pretty sure I was going to send it back the second I saw it in my box. It had a nice length, and I liked the colors, but I just don't feel having a pattern right across my bust and shoulders is flattering for my figure type. As always, I did an Instagram poll and pollsters were equally divided: 50% said to keep and 50% said to return. My next item I agonized over whether to keep or send back. I really loved them, but I had just purchased eggplant leggings from Stitch Fix two months earlier, plus, I already owned a pair of burgundy skinny jeans, however that pair is one size smaller and has a small tear in them. Ultimately I decided to keep these because leggings are different than jeans. I can't wear leggings with everything, whereas I can wear jeans with anything. I decided to keep the Stitch Fix pair because they were so much more comfortable than my other pair and I was worried the tear in my older pair would just get worse. I don't know how Stitch Fix does it, but they always have the most comfortable, best-fitting pants! I very rarely return pants that Stitch Fix sends me. The pollsters really liked the burgundy jeans too. 80% of pollsters said to keep them. 20% said to return them. 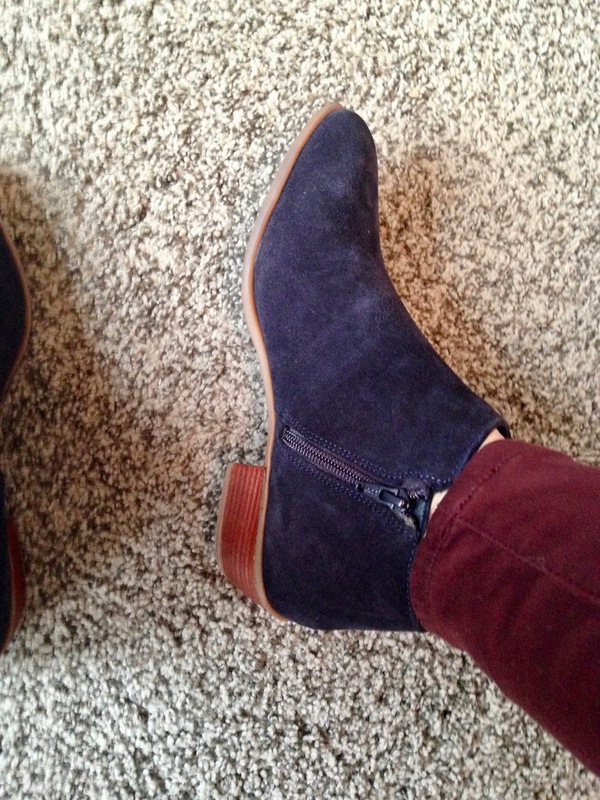 My next item in my Fix was a pair of blue suede booties. I absolutely loved these booties and I have been wanting a pair of navy blue shoes for ages. Blue, is not an easy color to find in a shoe! I still could use a pair of navy blue pumps or wedges to wear with dresses. The shoes are very simple, with a low heel and a zipper. They are also have a very low shaft; they are slightly below my ankle bone. I don't own any low booties like this, and thought the lower height might work better with dresses. Sometimes, I higher shaft in a bootie can make your legs look shorter. However, my Instagram pollsters were split on this item: 50% said I should keep and 50% said I should return. I was completely perplexed why. What didn't they like about these booties? The heel height? The low shaft? The color? Those are all the things I love these booties, so, for the first time ever, I did not listen to my readers and I kept them! This sweater was so popular on Instagram. 69% of pollsters said to keep, 31% said to send back. I must admit, I thought it was cute. But ultimately I didn't feel comfortable wearing something with such large polka dots. I kinda felt like a circus clown ha ha! Plus, the fit of the sweater wasn't right for my body type. It was too clingy in the waist and the high neck line made my already large bust look even bigger. I really liked this top. I thought the florals were pretty and it fit my body nicely. The stomach area was looser, and I liked the mixed materials incorporated into the top. I also liked the keyhole neckline . However, hubby did not like at all plus I already have so many dark florals in my closet, so I sent it back. Reviews were mixed on Instagram too. Only 64% of pollsters said to keep it, and 36% said to return it. In summary, in this box I received two sweaters, one pair of pants, one top, and one pair of booties. I kept two items, the booties and the pants. I can't wait to see what's in my next Stitch Fix box! I'm set to receive a new box today! Look for my selfie polls in my Instagram Stories and help me decide what to keep and what to send back! I normally do take my Instagram readers advice and keep what they say to keep, but I have no idea what was up with those booties, do you? If you'd like to try Stitch Fix you can receive $25.00 off your first box by using my Referral Code! Thanks Mica, I think I did too. So relieved to hear your air-conditioning is fixed. You guys are having quite the heat wave in Australia. I wish you could send us some of your warm air! I love that you poll the pieces on IG....I think that's always so fun to weigh in like that. And that polka dot sweater...I would have kept that maybe if the colors were better on me. For some reason, I've grown to love polka dots lately!! I love the IG polls too! They are very helpful to me. 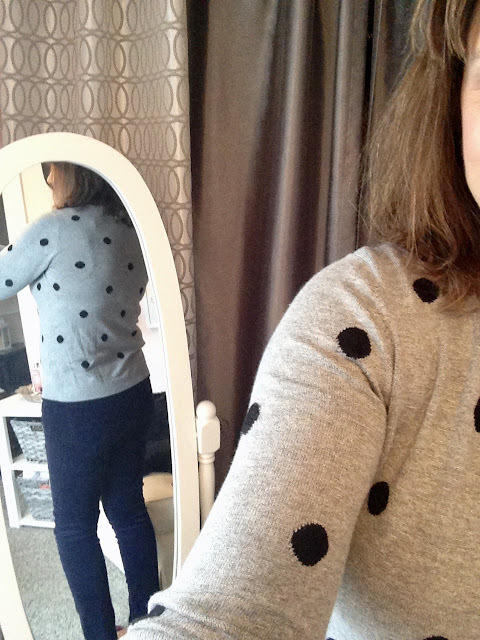 I did like the polka dot sweater but I wasn't crazy about it. I'm trying to only keep pieces that I either really love or are practical and I need. The sweater wasn't one of those pieces. I'm not actually a fan of booties .. I have not yet jumped on that bandwagon. However, I really liked the ones in this fix! It's hard to say what was up with the IG poll! I think you made the right choices by keeping the booties and the jeans. I love polka dots but tend to like much smaller dots. Thanks so much! I love booties and own a ton of them. I agree with you on the polka dots. I prefer smaller ones. You received some great pieces and I think they all look good on you. 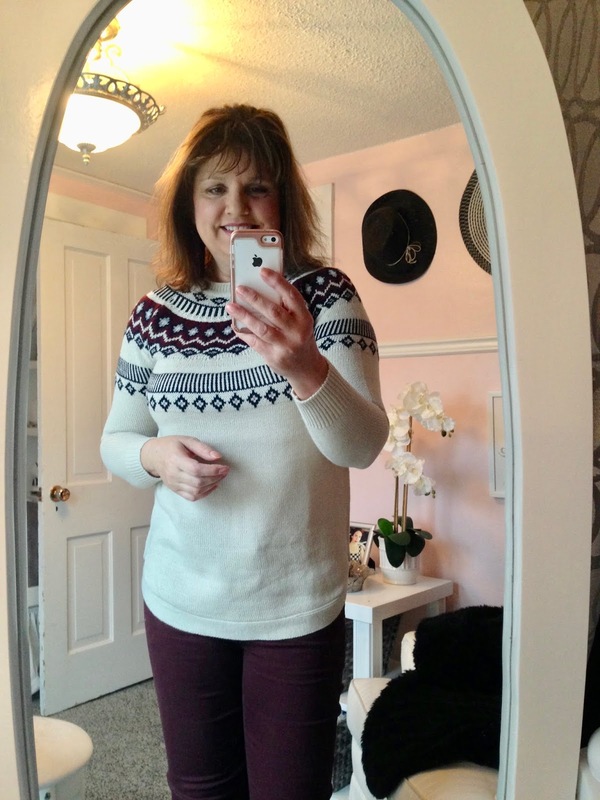 But I too am not a fan of the fair isle sweaters on me, so I don't own any either. The polka dot sweater looks cute. And not sure why the boots would have gotten only 50%. I think they look great and I love the lower heel. Thanks Ellie. Yea, I don’t like Fair Isles sweaters. The unpopularity of the booties remains a mystery to me. I do love that first sweater but have found no matter what other people think you've got to be comfortable with what you wear. Absolutely! Although I factor other people’s opinions in as to what I should keep, ultimately if I don’t like it I’m not keeping it. 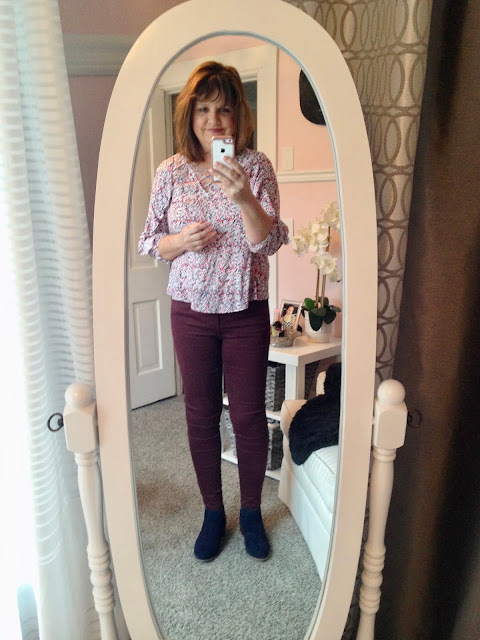 Love the burgundy jeans! Great choice. You have such a discerning eye! I missed your poll on Insta but would probably have voted KEEP on everything. I am just terrible, love to spend other folks for them. My fav pieces are the two sweaters and the pants. 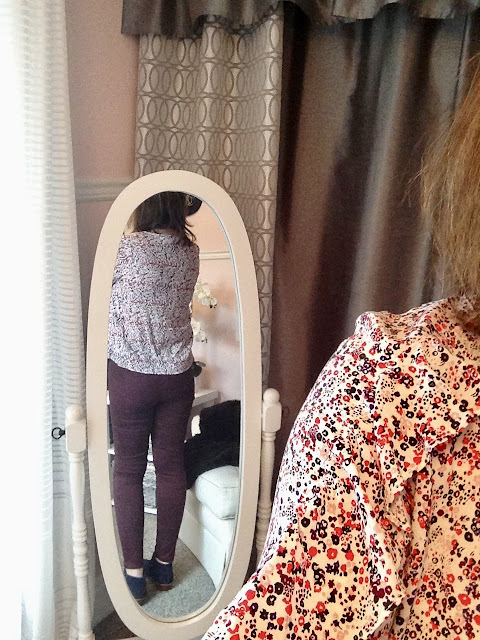 But I love how you paired the burgundy pants with that darling floral top, and the booties. 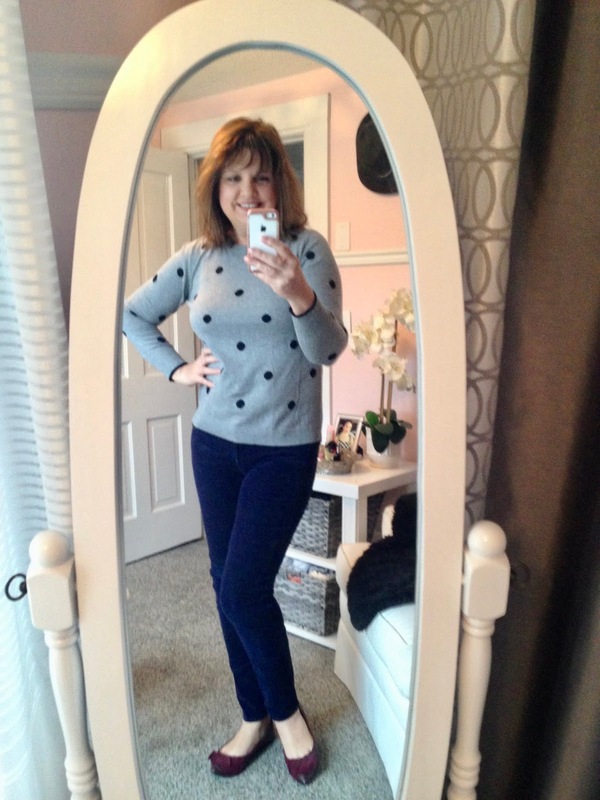 And the polka dot sweater, jeans or blue pants and the burgundy flats. Great looks!! Everything looks great on you. My favorite is the polka dot sweater. Love those booties too. I have a couple different colors. So east to slip on and go. Thanks Lisa. I did like the sweater, but not enough to keep it. I'm glad you like the booties. I was beginning to think "What's wrong with my taste that 50% of pollsters didn't like them". I've been loving my fixes lately. It's amazing how much better they are once they get your style figured out. Yes, I do think it takes a while for a stylist to "get you". Some people give up on it too soon. I think the booties are adorable! Love what you got Amy! the floral shirt I saw on another blogger from SF and liked it then too! It looks wonderful and so do the burgundy pants!. The isle sweater looks grea too and oh so cozy! Thank you! Yes, I saw the top on that blogger too. She returned hers as well. I kept the pants, but not the sweater. Call me the balancing one on the boots. Keep. I agree about the sweater pattern across the top. A bit weird where the pattern is place. You Had some pretty good choices in your box. Love the suede bootie. TFS with #BloggingGrandmothersLinkParty. 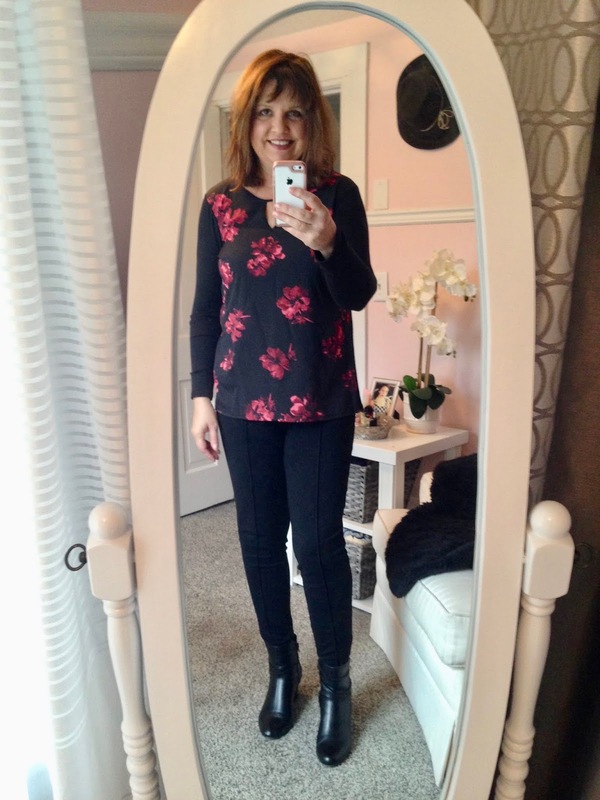 Yea, another reader takes my side and loves the suede booties! Thanks so much! 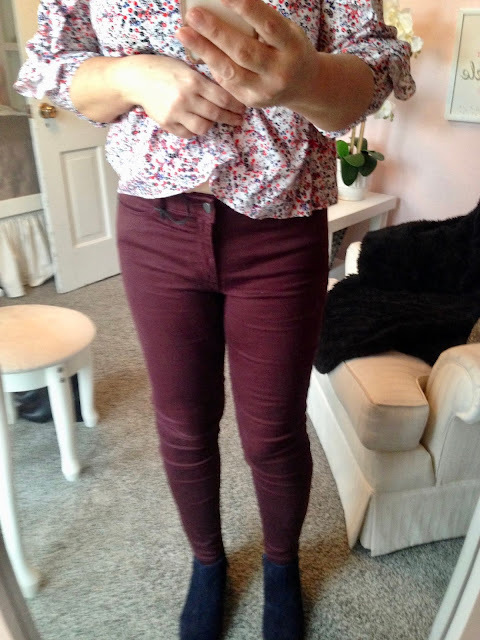 I really like the burgundy skinny jeans! Thanks Sylvia! I loved them too. Stitch Fix has the best pants. They always fit me like a glove and they're super comfy.